The Ghana handwashing program made contamination visible to the ordinary Ghanaian for the first time, effectively communicating a hygiene message using commercial marketing techniques.. In Ghana, diarrhea accounts for 25 percent of all deaths in children under five and is among the top three reported causes of morbidity. Children under five typically have three-five episodes of diarrhea and a similar number of respiratory infections a year. Nine million episodes of disease could be prevented each year by washing hands with soap. Ghanaians use soap, and they buy a lot of it. However, the soap is almost all used for cleaning clothes, washing dishes and bathing. In a baseline study, 75 percent of mothers claimed to wash hands with soap after toilet use, but structured observation showed that only 3 percent did so, while 32 percent washed their hands with water only. Mothers who did wash hands with soap generally did so because it felt good to remove dirty matter from hands, it was refreshing, it was a way of caring for children and it could enhance their social status. The Ghana Public-Private Partnership to Promote Handwashing with soap crafted a high-impact communication strategy with the slogan “For Truly Clean Hands, Always Wash with Soap.” The intensive phase of the program’s communication activities was carried out in the period 2004-06. During this phase, the program used three routes to bring the handwashing with soap message to the target audiences – mothers and caregivers of children under five years and children in basic school, ages 6-15 years, across the whole country. The routes included mass media, direct consumer contact and a district-level program through schools, health centers and communities. The communication strategy also included a public relations and advocacy component that targeted policy makers and opinion leaders and promoted the provision of handwashing infrastructure in schools and public latrines. Direct to consumer contact: Under the Direct Consumer Contact (DCC) Programme, an event management firm visited two districts per region in six regions and conducted 128 high-impact events in schools to reach 103,313 school children, 2,930 teachers, 926 food vendors and 132 events in health centers and communities for 11,500 mothers. 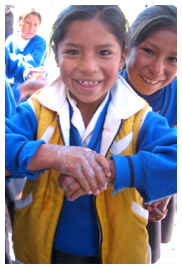 DCC is used as an interpersonal communication strategy that provides information on handwashing with soap in an innovative and interactive, face-toface manner. This direct contact allows consumers to ask questions and converse about handwashing with soap, which facilitates behavior change. PR campaign: A public relations program targeted at opinion leaders and strategic targets delivered continued press and media coverage in support of the aims of the handwashing program. A number of radio and television discussion programs and interviews were held throughout the country on national media and district-specific FM radio stations. An advocacy brochure that outlined the strategy for the initiative was also produced and distributed to strategic targets and partners. An evaluation reported that, after six months of the campaign, rates for handwashing with soap for mothers were over 80 percent. Exposure to all campaign materials was also high, with almost everyone aware of and able to sing the campaign theme song, and with more than 80 percent of children and adults reporting more handwashing with soap since the campaign. The Ghana handwashing program for the first time made contamination visible to the ordinary Ghanaian and was able to communicate a hygiene message in an innovative manner along the lines of commercial marketing. A major lesson from the Ghana program was that when partners from different backgrounds and sectors are not accustomed to working together, establishing common grounds and trust takes time and effort. Another important take-home lesson was that the public and private sector can work together for the public good when there is transparency, the strengths of reach are recognized and each member is treated as an equal in the partnership.